Sound-insulated centrifugal fans. Maximum air capacity up to 2150 m³/h. 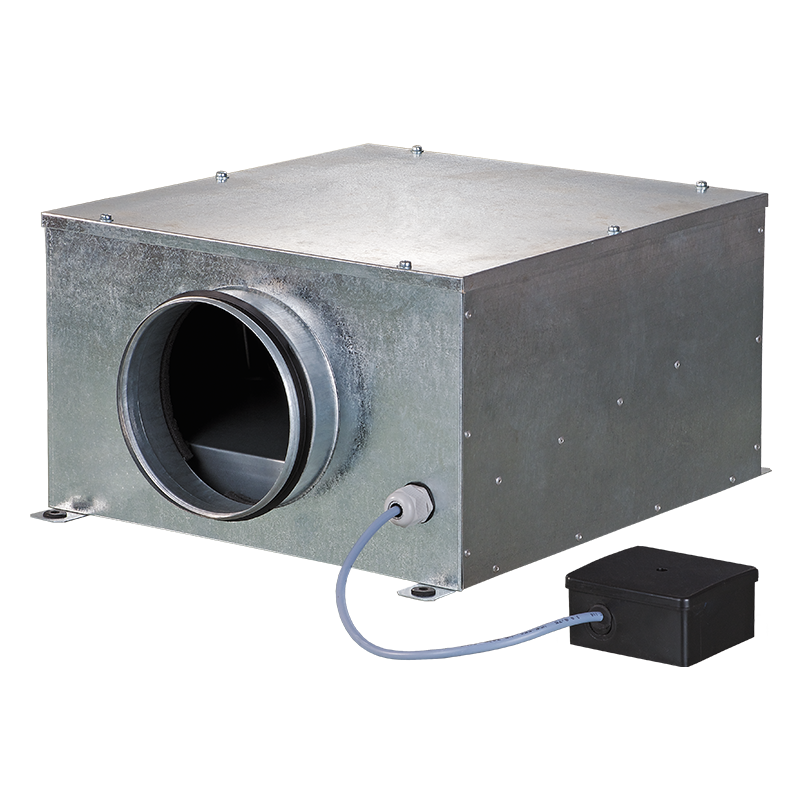 Supply and exhaust ventilation systems installed in premises with high requirements to the noise level.Compatible with Ø 100 up to 315 mm round air ducts.Suitable for limited mounting space. Galvanized steel casing internally filled with 30 mm thermal- and sound-insulating layer made of non-flammable foamed polyurethane.Connecting spigots are equipped with rubber seals.Fixing brackets for easy mounting. Two-pole external rotor asynchronous motor with centrifugal impeller and backward curved blades.The motor is installed on specially designed vibration-damping mounts to absorb vibration and noise.Equipped with ball bearings for longer service life.Integrated thermal protection with automatic restart.Dynamically balanced turbine. Mounting in any position.Fixed to wall or ceiling with a fixing bracket supplied as a standard.Flexible air ducts are fixed on fan spigots with clamps.Power is supplied through an external terminal box. G – temperature and speed controller with external temperature sensor fixed on 4 m cable. The fan is equipped with a power cord with a socket or a plug (G1).GI – temperature and speed controller with a sensor built into the fan casing. The fan is equipped with a power cord with a socket or plug (GI1). G and GI options are used for automatic speed control depending on indoor temperature. The best ventilation solution for the premises requiring permanent temperature control as greenhouses, orangeries, etc.W – the fan is equipped with a power cord and a socket or plug (W1).